Calvin Wasson Hinshaw11,12 [Calvan Wasson Hinshaw11, Calvin Wason Hinshaw13, Wasson Calvin Hinshaw6, Wash Hinshaw7,14]. Hinshaw, C. W., age 28, born in Iowa; parents born in Tennessee; farmer. Hinshaw, Mary, wife, age 32, born in Tennessee; parents born in Tennessee; keeping house. Hinshaw, Leonard, son, age 7, born in Iowa; father born in Iowa; mother born in Tennessee; attended school. 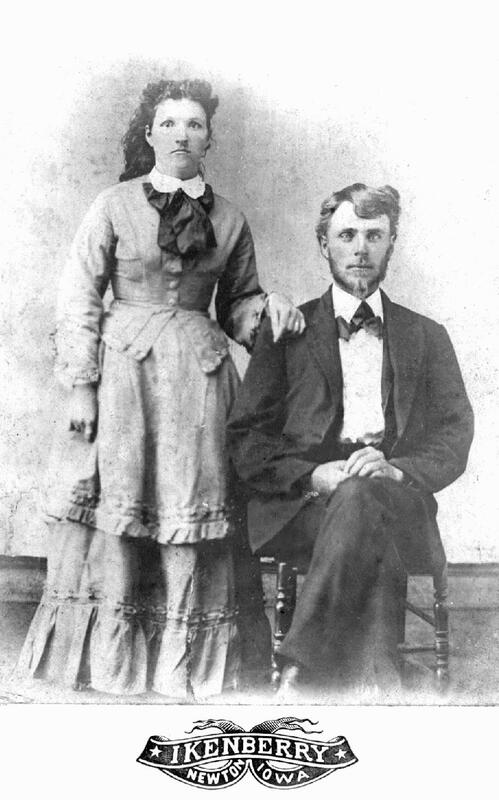 Hinshaw, Lawrence, son, age 5, born in Iowa; father born in Iowa; mother born in Tennessee; attended school. Hinshaw, Ervin, son, age 4, born in Iowa; father born in Iowa; mother born in Tennessee. Hinshaw, Leroy, son, age 2, born in Iowa; father born in Iowa; mother born in Tennessee. Hinshaw, Alice, daughter, age 10 months, born in Iowa; father born in Iowa; mother born in Tennessee. Calvin W. Hinshaw, age 32, born in Jasper County, Iowa; carpenter. Mary R. Hinshaw, age 36, born in Tennessee. Henry L. Hinshaw, age 11, born in Jasper County, Iowa. Lorena [sic] Hinshaw, age 9, born in Jasper County, Iowa. Erven Hinshaw, age 8, born in Jasper County, Iowa. Roy Hinshaw, age 7, born in Jasper County, Iowa. Alace F. Hinshaw, age 5, born in Jasper County, Iowa. Rhodalunette Hinshaw, age 1, born in Jasper County, Iowa. Mr. C. W. Hinshaw has purchased of Aaron Hackney, administrator of the estate of Mrs. E. A. Hinshaw, her residence property on Depot Street. On Tuesday last occurred the death of C. W. Hinshaw after a lingering illness. The funeral will be held Thursday after which he will be laid to rest in Amboy Cemetery. C. W. Hinshaw died at his home in Kellogg on Tuesday of last week, after a painful illness of two months, resulting from a severe stroke of paralysis. He was born near Amboy, Aug. 7, 1852, and his home has always been in Jasper County. He was married to Mary R. Beals, Oct. 2, 1874, and to them were born fourteen children, eight of whom with their widowed mother, survives him. Mr. Hinshaw was a member of the Christian Church, an honorable, upright citizen and enjoyed the confidence and esteem of everybody. Hinshaw, Mary, head-of-household, age 51, born June [..year unclear..] in Tennessee; parents born in Tennessee; widow; 14 children, 8 living; [..occupation unclear..]; owned home (free). Hinshaw, [..unclear..], son, age 26, born [..Jan or June?, year unclear..] in Iowa; father born in Iowa; mother born in Tennessee; occupation: farm laborer. Hinshaw, [..unclear..], son, [..age & birthdate unclear..], born in Iowa; father born in Iowa; mother born in Tennessee; [..occupation unclear..]. Hinshaw, Ervin, son, age 24, born May 1876 in Iowa; father born in Iowa; mother born in Tennessee. Hinshaw, Leroy, son, age 22, born Dec 1877 in Iowa; father born in Iowa; mother born in Tennessee; occupation: d??yman. Hinshaw, Alice, daughter, age 21, born Apr 1879 in Iowa; father born in Iowa; mother born in Tennessee; married, no children. Hinshaw, Lula, daughter, age 16, born Nov 1883 in Iowa; father born in Iowa; mother born in Tennessee; attended school 9 months. Hinshaw, Clar, son, age 13, born Aug 1886 in Iowa; father born in Iowa; mother born in Tennessee; attended school 6 months. 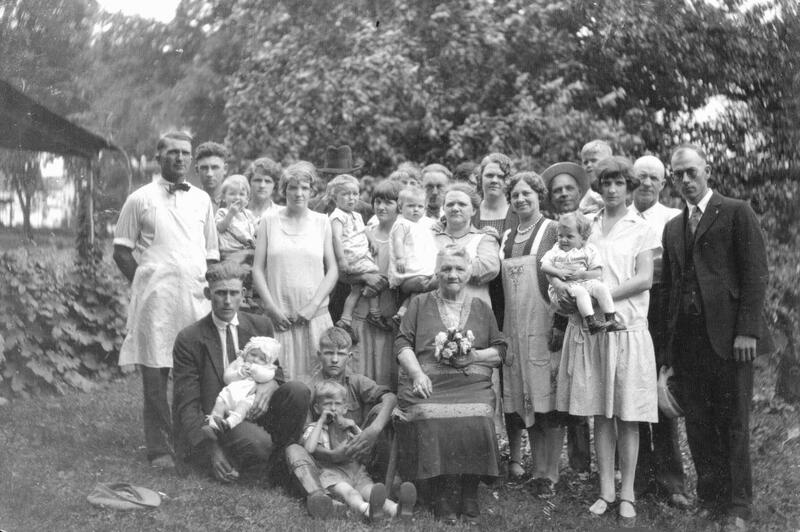 Hinshaw, Leo, son, age 10, born Nov 1889 [unclear] in Iowa; father born in Iowa; mother born in Tennessee; attended school 9 months. Le Claire Hinshaw, Kellogg P.O. Hinshaw, Mary R., head-of-household, age 61, born in Tennessee; father born in U.S.; mother born in Tennessee; widow; 14 children, 7 living; occupation: "own income"; own home (mortgaged). Hinshaw, John Leo, son, age 20, born in Iowa; father born in Iowa; mother born in Tennessee; occupation: "none". Mary Hinshaw, age 65, born in Tennessee; parents born in Tennessee; widow; owned home (free), $500 value; church affiliation: Christian. Hinshaw, Mary, head-of-household, age 73, born in Tennessee; parents born in Tennessee; widow; occupation: none. Hinshaw, John, son, age 30, born in Iowa; father born in Tennessee [sic]; mother born in Indiana [sic]; single; occupation: none. Hinshaw, Mary, head-of-household, age 76, born in Tennessee, widow; father: Beals, Caleb, born in Tennessee; mother: Ervin, Margaret, born in Tennessee; parents married in Tennessee; church affiliation: Methodist E.
Hinshaw, Henry L, son, age 51, born in Iowa; single; father: Hinshaw, Calvin, born in Iowa; mother: Beals, Mary, born in Tennessee; parents married in Newton, Iowa; church affiliation: Methodist E.
Hinshaw, Molly M., head-of-household, age 81, born in Tennessee; parents born in Tennessee; widow; owned home ($700 value); no radio in home; occupation: none. 1905 Iowa state census, Kellogg Township, Jasper County, Iowa; roll IA-92. Death notice for Mattie Hinshaw. 1910 census, Kellogg, Kellogg Township, Jasper County, Iowa; ED 26, pg 3A, line #7, dwelling #58.
records of Raymond Earl Wormley (1920-1997), probably information from his aunt Zola Alice Trout Cleverley. "Eldora Herald-Ledger" (Eldora, Iowa), Jun 23 1953; http://www.ancestry.com. 1930 census, Kellogg, Kellogg Township, Jasper County, Iowa; roll T626-660, ED 11, pg 1B, line #98, dwelling #27, family #27. "Kellogg Enterprise", Jun 8 1888; http://www.ancestry.com. 1915 Iowa state census, Kellogg P.O., Kellogg Township, Jasper County, Iowa; roll IA1915-252, card #233. 1920 census, Kellogg, Kellogg Township, Jasper County, Iowa; roll T625-496, ED 26, pg 1A, line #48, dwelling #14, family #15. 1925 Iowa state census, Kellogg, Jasper County, Iowa; roll IA1925-1771.